Oktoberfest is on it’s last legs over in Germany. There is a little over two days of fun left during this 176th celebration that originally started out as a wedding celebration. I hope that one day I get to go over there and experience this huge fest. Until I do I have to settle for the menial Oktoberfest and harvest festivals in the midwest that I can attend. The one thing that air jordan 5 really bothers me with this local affairs: most of them are serving your normal macro brews and their is no German heritage behind the food. 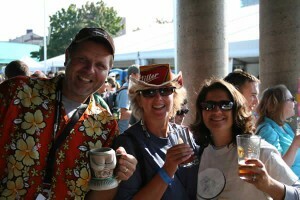 That’s where I hope this years Two Beer Dudes site kickoff and Oktoberfest get together will step it up a notch. Rich and I are planning to have authentic food: sausage from a local German meat market, sauerkraut, German potato salad, pretzels, German mustard, etc. We have the food down and we hope that the 20+ American craft beers that will be in attendance will help. The beer is mainly from the midwest, imagine that, and Oktoberfest, pumpkin, and harvest beers. We hope that the 17th will be the kickoff of an annual event. Enjoy! 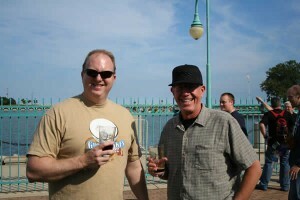 Saturday’s get together was a really good time for all: beer drinkers, spouses, and kids alike. The burgers, hot dogs, brats, and chicken on the grill hit the entire gambit of what anyone would like. The edible waffle bowls filled with ice cream was a perfect after dinner touch that kids and adults both enjoyed. The games of bags were fun, especially if you won. Thank you Mark and Carmen for opening your house to us all. 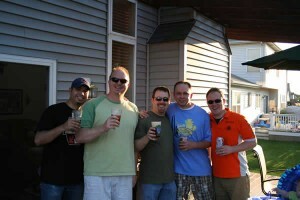 Each of the guys brought their own touch to the party in terms of beverages. West Coast IPA by Green Flash Brewing Company, Hop Whore by Tyranena Brewing Company, Marsala Mama by Townhall Brewing, and Collaborative Evil by Flossmoor Station Brewing Co. were all beers that everyone tried. There was nike kobe 9 even some Pabst Blue Ribbon. 🙂 My favorite of these beers was Hop Whore. It is a mighty good Imperial IPA that finishes smooth with no alcohol presence. Both Marsala Mama and Collaborative Evil were in bombers that had been shipped from Minnesota and sat for a good 7 to 10 days. I don’t know if this had anything to do with my experience, but neither lived up to the hype. We all agreed. Yeah, Darkness by Surly Brewing Company is that damn good! During the evening Ed went around to each of us and let us know that his wife is pregnant with their first child. A very special occasion. Congratulations! I am excited for him and his wife as he will make a great father and loves kids. 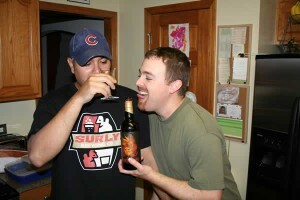 In honor of the news, Mark went down into the cellar and and broke out a bottle of Darkness by Surly Brewing Company. Darkness, oh sweet Darkness. That is one fine beer. We had 2008 at cellar temperature. So smooth, so fine, so damn wonderful to all of the senses. This beer is the best Stout I have had to date. 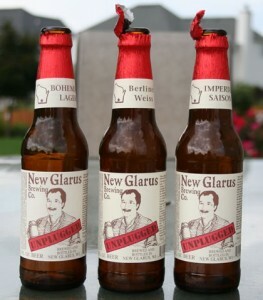 I will be making the trek up to Minnesota in a month with Mark to get some for myself. Mark's ginormous and awesome craft beer collection. 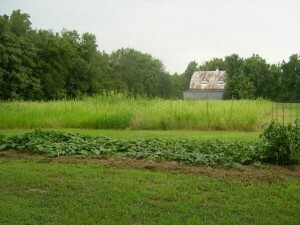 Speaking of Mark’s cellar: what a wonderful site for any American craft beer lover. It is truly a great collection. There easily had to be 125 bottles (mainly bombers) nike kobe 9 elite gs of hard to get and highly sought after beers. I thought I was in a beer museum or beer heaven; maybe both. 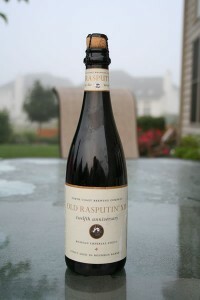 He has beers that are numbered and one really rare one in which only 30 or so bottles were every created. You could easily say it was a celebrity list of beers. Next time I am over I will take my shoes off before entering the sacred cellar and never look a beer straight in the eye. The best thing about all these beers: Mark wants to share and enjoy with the group. That is awesome and greatly appreciated. I even got an invite to the Tuesday Night Beer Club (TNBC) a once a month get together by Ed, Mark, Shawn for sharing good American craft beer. From what I understand the group is growing too. More to come as I find out the details. Enjoy! I am the first to admit that rating and reviewing beer can be fun but I sometimes cringe at the fact of drinking a new beer, knowing that I just can’t enjoy it. Sometimes it is just good fun to pull a beer out of the fridge, stare it in the face and know that you are going to enjoy it soon, no strings attached. Five beers into my preparation my feet are midly starting to tingle (really enjoy that feeling). I have five didn’t bombers of Jolly Pumpkin Artisan Ales in the fridge to enjoy with one of the invitees that enjoys American craft beer. My only apprehension: he doesn’t like “funky” beers. If you have ever had a beer from Jolly Pumpkin you know that they brew with wild yeast strains and usually age everything in some type of oak barrel. I personally don’t know if Jolly Pumpkin is a great brewery, I just know they make some interesting brews that ignite my interest. How will someone that doesn’t like IPAs enjoy a funky beer? I can only guess. I hope that he goes along with the ride and doesn’t ruin the cool buzz I have to this point. Enjoy! Sierra Nevada Kellerweis one of three beers reviewed last night that all made my palate dance for joy. Friday night beer reviews are fun. Actually any day of the week is a good night to review beers and, if you really want to get into it, any day, any time is a good time to review beer. The lineup for last night was mainly of beers I had laying around the house as I am actually getting to a point where I don’t have much to try. free run 3.0 v4 femmes Time for re-drinking. Riverwest Stein Beer was in third place, not by much but Kellerweis and 90 minute IPA were both outstanding. Kellerweis was my first beer of the night and lasted a total of six sips. It is a really good Hefeweizen while 90 minute IPA was a really good American Imperial IPA. I really couldn’t decide between the two as they are both so different but both so damn tasty. My thoughts: depending on the mood you are in, get them both. Enjoy! New Glarus Brewing Company is one of my favorite breweries. So it was with great anticipation that I decided to go unplugged last night. Going with Unplugged Berliner Weiss, Unplugged Bohemian Lager, and Unplugged Imperial Saison. The Berliner Weiss and Imperial Saison were outstanding. I thought both did a great job of sticking to the style. They also were just damn fine tasting and eye appealing beers. I don’t want to say much about the Bohemian Lager since I believe I had a bad bottle. air yeezy 2 I read what the site said about the beer and the bottle, but couldn’t find the aromas or flavors that should be associated. I actually didn’t finish the beer but would enjoy trying another. I have tried 11 styles of New Glarus Brewing Company beers and have enjoyed them all. I have another six to be reviewed and I can’t wait. Enjoy! 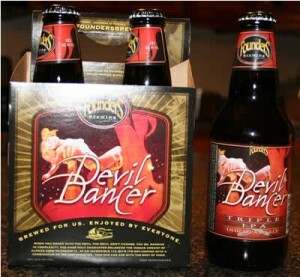 I enjoyed and rated Founders Brewing Devil Dancer a few weeks back. Enjoyed the beer thoroughly! So the weekend wasn’t all that pretty. I spent around 25 hours doing server updates and moves that took a huge bite out of my enjoyment and beer consumption time. 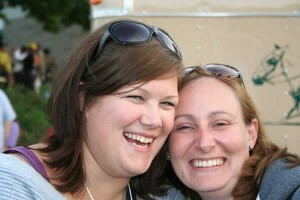 The only time I had was Saturday night when I attended the Jimmy Buffett concert. Good time but I never recommend drinking any of the mix drinks there, they are horrible! air max thea femmes To add insult to injury, they are $10 a pop. Luckily I found a $20 bill on the ground that fell out of some drunk and staggering imbeciles pocket. I still cringe that I spent that money on those brutal drinks. Sunday night rolled around, the server work had take its toll – I was tired and I had had a huge weekend. I needed something to put an exclamation point on the weekend. I needed something that would refresh in a big way. Down went my last Devil Dancer and I fell fast asleep with a smile on my face. Enjoy! Beer store visit seems to have come quickly this week. Maybe I wasn’t thinking that much about it because I am still overwhelmed by the amount of beer I purchased this past weekend on the brewery hop. My main goal of the day was to try and purchase some Lakefront Brewery beers since I passed while up in Wisconsin and because the wife asked (ordered) me to. Of course I had to stop off and ask Travis what they got in new in case something really jarred the senses. They only got in two from Dog Fish Head that are both based on the “old” recipe idea. air jordan 11 femmes Neither really interested me since I still haven’t drank the Shai Tea I purchased almost a month ago. Besides they aren’t cheap. So I asked about their selection of Lakefront which was only two in depth, neither of which my wife fancies. Going home empty handed from my Wednesday beer store visit? Oh, the thought makes my stomach upset. 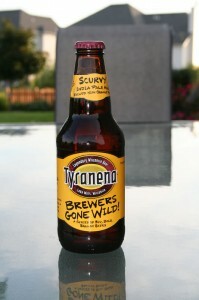 So I did a quick scan of the aisle and noticed there were Tyranena Brewing Company choices on the shelf. While in Wisconsin I didn’t see the Scurvy IPA brewed with Orange Peel but there it was. I have heard good things, so we shall see. Enjoy!